Whilst in Aguascalientes, I was taken to a rehab centre for disabled kids. 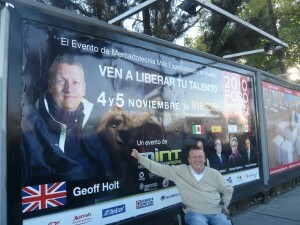 Each year, Mexico holds a Teleton event, much the same as our Children in Need. However, ALL proceeds, every peso, goes to an organisation called C.R.I.T. There are 15 CRIT centres spread across Mexico’s 31 States. The CRIT Centre in Aguascalientes sees up to 400 kids a day and has more than 1500 children on their books. I’ve seen some therapy rehab centres in my time, indeed I’m a patron of the Rose Road Association here in Southampton, but I have never seen anything like this. I was met at 6.00pm by 50 kids, their parents and therapists. The other 350 had gone home as they could wait any longer. Some may prefer money being split across many hundreds of smaller charities, but the Mexican Teleton CRIT example of giving ALL monies to one organisation is hard to criticise. Using economies of scale, these centres are simply breath-taking in the range of therapies offered. And not a sad face in the centre. Just a feeling of happiness, joy and determination. I was made to feel so welcome but it should be me thanking them. We could learn a lot from the CRIT model. CLICK HERE for more info (information in Spanish). I’m really excited to announce that after a year of hard work, the audio version of my book, Walking on Water, is now available. Heartfelt thanks to my friend Nick Pomfrett for his outstanding reading and editing of the book and to Louise from Audible for her belief and support of the project. Trust me, if you have ever written a book and have a desire to make it available as an audio book, then I wish you well. The processes you have to go through, the hurdles you have to jump over, it makes the writing of the book seem the easy part. Will work on any PC, MP3 player or iPod or iPhone. You can now download the audio version either by clicking on the Audible link on my home page, or CLICK HERE. The book is nearly 12 hours long so why not download it as a present for somebody this Christmas. Not yet worked out the figures but a % of my royalties will be going to Blind Sailing UK. For further information on Nick Pomfrett’s website providing sailing opportunities for the visually impaired, CLICK HERE. The RYA’s Sailability division have launched a new APP for the iPhone. It gives details of Sailability sites around the UK and includes a number of interactive tools. I’ve downloaded mine and it’s a great gadget – and it’s free too. Go to the APP store on iTunes ans search RYA Sailability. Having received my Hon Doctorate for Sport last week from Solent University, they have uploaded a great little video they filmed immediately afterwards which you might like to watch. CLICK HERE then scroll down to the video at the bottom of the page.Finally, a quick reminder if you are not doing so already to join my Facebook group and follow me on Twitter. It’s really easy. CLICK HERE to join my Facebook group. CLICK HERE to follow me on Twitter @WhetWheels.